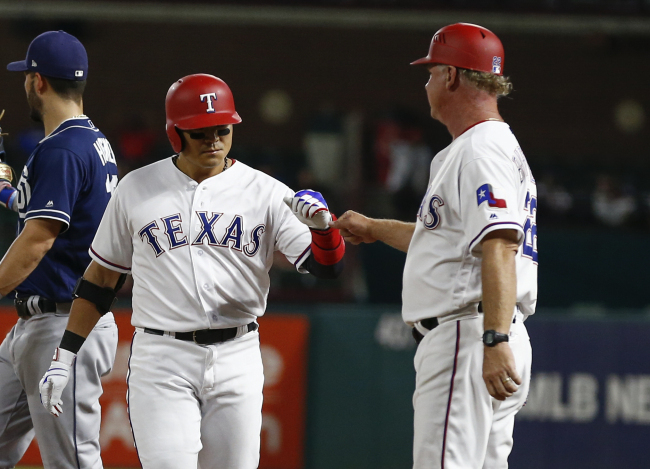 Texas Rangers' South Korean outfielder Choo Shin-soo has extended his career-high on-base streak to 39 games. Batting leadoff and playing right field, Choo picked up a ninth inning single against the San Diego Padres to keep his streak alive at Globe Life Park in Arlington, Texas, on Tuesday (local time). He has been on base safely in every game since May 13 against the Houston Astros. This is the longest active streak in Major League Baseball, and the second longest of the season after a 40-game streak by Odubel Herrera of the Philadelphia Phillies. Choo was retired in his first four at-bats. He swung on the very first pitch he saw from San Diego starter Tyson Ross in the first inning and grounded out softly to first base. In the third inning, Choo struck out looking on a 0-2 cutter on the outside corner. In the fifth, with Ross still in the game, Choo lined out back to the pitcher after just two pitches. Choo entered this game having seen 4.11 pitches per plate appearance, 14th most in the American League, but saw a combined six pitches in his first three plate appearances Tuesday. In the seventh inning, Choo worked a new pitcher, Matt Strahm, to six pitches before striking out for the second time in the game. With two outs in the bottom of the ninth, and the Rangers down 3-2, Choo got his final plate appearance against San Diego closer Brad Hand. At a 2-2 count, Choo lined a single to left to reach base for the first time. He was lifted for pinch runner Ryan Rua, but the Rangers failed to rally and ended up losing 3-2. Choo is sixth in the AL with a .393 on-base percentage and third with 52 walks.